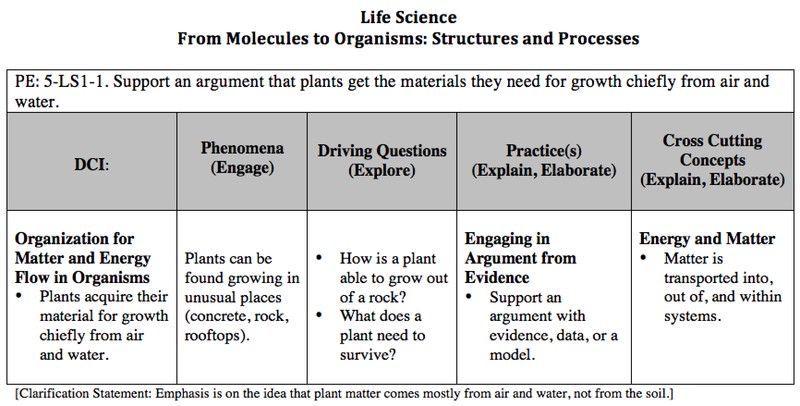 Below is a PQP chart and phenomena video I created to target a 5th grade Next Gen Science standard in Life Science. I’m excited about the Next Gen standards, as the framework simply makes sense. Learning in Next Gen is driven by asking questions and defining problems. Units of study begin with phenomena that engage learners and pique their curiosity. Each phenomenon leads to a driving question that encourages research, investigation, experimentation and problem solving to reach a conclusion. Feel free to use the resources below with your 5th grade kiddo(s). This video can be used in class or given for homework. Click here or on the image above to print or download the handout. Problem Question Practice (PQP Learning Sequence) – a tool to order concepts from a conceptual flow into a Phenomenon-Question-Practice (PQP) chart allowing an instructional sequence that resonates with the 5Es (engage, explore, explain, elaborate, evaluate) instructional model. PQP charts place DCI concepts into a conceptual flow organizing concepts into linear order. Below is an overview of the PQP learning sequence (also from Marcus Tessier’s site).